We are very proud and honored to have received 5-star ***** ratings from 100% of our guests at Windows on the Sea! A heartfelt thank you to each of you who has taken the time to share your experience! "Beautiful and restful. Right on the beach with fantastic, long views. A private beach access and onto the sand for great walks and rock hunting. The Home itself is very well appointed with everything you may need and so clean! They accept dogs, but you would never know they had ever been there. We could not believe our luck in finding this home. Denise is a wonderful hostess and available to answer any questions or give information on the area. It was so lovely to see the beautiful sunset on 12/31/18--ending the year and beginning another--from the warm and comfort of this beautiful home." "Superb in so many ways! Our stay at Windows on the Sea couldn't have been better. What a treat it was to walk in and see that the online photos didn't do the place justice! Denise has made it a special place, and the vibe is like a warm hug. There are special touches everywhere (great sheets, soft tissues, thoughtful beach stuff, etc. ), and cooks will love the kitchen! It is very clear that Denise has given much consideration to making your stay a memory maker. Thank you! We hope to return soon :)"
"Awesome ocean views! If you're looking for a spot to do some ocean watching from the comfort of your couch, this is the place! We enjoyed watching the storms approach the coast and the sunsets were absolutely amazing. The furnishings of this condo are updated and comfortable. The unit is self-contained with EVERYTHING you need for a beach get-away. Our only suggestion: pack an extra sweater for a winter stay. We felt the living room with all the big, beautiful windows and radiant floor heat, was a little on the cool side for the 2 of us. (Other rooms were toasty warm.) Definitely not a deal breaker though. We hope to return for some wave watching in the new year. Thanks Denise!" "Very very nice Wonderful Place to stay also very dog friendly. Wonderful views and very nice condominium my wife and I and our hound dog could not have found a better place to stay everything was so clean and nice and any questions were easily handled.Thank you so much for letting us enjoy this incredible property!" "Came to Rockaway for the first time for a little anniversary getaway and felt so spoiled by these views! Not to mention 3 days of fantastic fall sunshine. This is such a special place that allowed us to feel secluded on what seemed like a private beach hideaway. We’re already talking about coming back with our little girl and sharing these amazing memories with our parents! Thank you for a beautiful retreat!" "Incredible View in a Stylish Setting. We've stayed at lot of places on the coast over the years from Rockaway Beach to Cannon Beach to Seaside and places in between and this place is hands down the best place so far. You really can't beat the view with the floor to ceiling windows and the ocean is right there in all it's glory. It's a very easy walk to the beach with no steep steps like we've had at other places. Having the use of the elevator, which opens right into the apartment makes this an ideal spot for someone elderly...although my 85 year old in-laws insisted on taking the stairs, it's a nice option to have. When searching for places to stay, We're often put off by the photos of old secondhand furniture with plaid green couches, old paisley comforters and overdone "beach decor". There's none of that here, which is another reason it caught our eye. The place is nicely furnished with modern and comfortable chairs, couches and beds, granite kitchen countertop and nice appliances. It's just like we'd want our place to be if we owned a place here, which made it really homey and comfortable. We were also extremely impressed with how well the place was stocked. There was not only the usual coffee and tea, but lots of tea options as well as a complete set of spices, cooking oils, condiments, sugar, flour..... The kitchen was also well supplied with lots of pots & pans, casserole dishes, and any utensil you could think of, which was very nice. We had such beautiful weather during our visit, we didn't spend a lot of time inside watching TV, but I was surprised to find there was DirectTV, with a plethora of channel options. I was able to watch some of the baseball playoffs and Saturday football as well. If it had been rainy weather, there would have been plenty of options for things to watch on TV. I could go on and on about the beds being comfortable, the check-in process being easy, but I'll just wrap this up by saying we thoroughly enjoyed out stay and are looking forward to staying here again during our next trip to the Oregon Coast!!!" "We had an incredible time during our stay here. Your place is amazing and the view is to die for. We’ve stayed at a lot of places on the coast over the years and this is by far the nicest place we’ve stayed. We were also blessed with some beautiful weather during our trip. I would have never expected to have clear blue skies and temps near 70 degrees in the middle of October. It mad our time here just that much better. We had nice long beach walks, strolls thru town and checked out the Ancient Red Cedar trees. We will definitely be back here next time we come to the coast." "Once again W on the S was perfect! We are not sure who enjoys the place more, us or the dogs. Thank you for keeping the place so clean, stocked and welcoming. Our sunsets were all lovely and each morning we woke to pink skies that became lovely shades of blue. Your location and view are superb! Gary says you have the best provisioned kitchen of any place we have stayed, which is a huge compliment from this chef. Hope to come again." "Beautiful Location! We enjoyed a great family vacation. This was the perfect place to stay and there is everything you need to enjoy a trip to the Coast. We had a great view of the Sunset from the living room, easy beach access and fully stocked kitchen. We are already planning to return next year." "An unforgettable, and beautiful ocean beach side retreat! It is the perfect location to enjoy the beach, inside and out. You are also close to great fishing tours or just bring some fish back to condo! The kitchen was well stocked, as well as a few things we could enjoy on the beach. It was very peaceful and felt just like home. What an awesome memory maker and we look forward to continuing our family tradition here, and enjoying this beach retreat!" "Spectacular week in Rockaway Beach! This is our third time staying in this beautiful condo! It's so nice to know all the amenities are already there. All you need to really do, is show up and bring some groceries with you. Once again, the view is breathtaking! It is so clean and comfortable. We sure wish we could stay here, forever!! As always, we are never disappointed with Denise and her beautiful Condo. Can't wait till next time! Thanks for a great week!" "This place felt like a dream! The windows and view of the ocean was incredible!This was our first trip to the coast of Oregon and we were traveling with another couple. The condo was perfect. Cute, clean, and the view is incredible. Obvious plus is the proximity to the beach, but there was also really great hiking 20-30 minutes away. We loved our stay!" "This condo is even better than the pictures. The tall ceilings paired with the wall of windows facing the ocean feel spacious and leaves you feeling peaceful and relaxed. Open the windows to hear and feel the ocean. Denise goes out of her way to make everything special. Comfy furniture, beds, amazing, well-stocked kitchen, deep over-sized tub; this condo won't disappoint you. You'll leave planning your next return." "Can't get any closer to the beach than this location. Everyone in the family enjoyed various aspects of the rental. Close to the beach but with nice amenities. Very comfortable stay." "Beachcomber's Paradise! My husband and I from Twain Harte, CA met with his sister and her husband from Coeur d'Alene for a one week mini reunion. The condo was so lovely and the view so breathtaking that we really didn't need to leave the unit to enjoy our time in Oregon. We wanted for nothing from the well stocked kitchen to the well equipped bathrooms. Denise responded to every inquiry and request immediately. We did make time to visit many interesting towns nearby and went as far as Astoria which we recommend if you have the time. We would love to return." "Outstanding Oceanfront Abode. Absolutely perfect location and great accommodations. The owners have thought of everything and provide many amenities. We won't have to pack nearly as many items if we return (which we would love to do). This place is top notch and the owner is great." "A lovely condo, literally right on the beach. Awesome views! First of all, I must say that Denise was and is a wonderful host, easily available to assist if needed. We had no issues, and the bottle of wine & cut flower waiting for us was a nice touch! The kitchen has everything you need if you want to cook and enjoy the views over dinner, and her home was spotless and very comfortable. If you enjoy fantastic ocean views and walks on the beach, then look no further. We would love to come back!" "The Best View and Beach Front. This is an absolutely lovely condo with a stunning view. Each day there was a window of time to be on the beach without rain, but when it was raining we felt like we were on the beach as we looked out the expansive window. Every day there is light streaming through the windows and when the sun was out sitting next to the window was heavenly. This condo is just plain great for peace of mind!! Just get yourself to this oceanfront beauty and stay as long as you can!!" "If you like ocean views..... If you don't mind viewing the ocean and the wide beach expanse through floor to ceiling windows, then you will probably like this place. Tastefully appointed throughout, this place hits it out of the park. Can't wait to return!!" "We appreciated our spectacular view of a quiet beach, with easy accessibility. The condo was comfortable, clean, and quiet. Highly recommended." "Truly a welcoming home away from home. Denise provides far more amenities and conveniences than the typical vacation rental (and I have rented many). The location is fantastic given walking right out to the spacious beach, and made for easy drives from Tillamook south to Astoria north to hike, zipline, shop, tour the cheese factory, get fresh crab and oysters, and more. The dogs loved looking out the floor-to-ceiling windows (and we people just said 'wow' every morning when we woke up to the amazing view). What you see in the condo description is what you get. This place will not disappoint." "Mesmerizing views with the comforts of home. Windows on the Sea was absolutely spectacular. The weather was your typical March coastal mix of sun and rain off and on but we didn’t care at all. Nothing can take away from the view we enjoyed. The beach had little foot traffic when compared to other areas such as Cannon Beach and that is exactly what we wanted. The unit is spacious and full of light. Everything you need to have a short or long stay can be found inside. The binder that provides an overview of the electronics, BBQ, local services, local activities etc. leaves you with no question unanswered. Everything was spotless when we arrived and we quickly relaxed as we gazed out the windows. When it comes to owner, Denise is the most responsive owner I have ever dealt with which made things seamless. We are already looking forward to coming back again. Thank you, Denise!" "Stunning Oceanfront Location! It's hard to imagine a more spectacular location on the Oregon coast! This stunning condo has large floor to ceiling windows that look directly onto the Pacific Ocean and a long stretch of beautiful beachfront. The owner is a gourmand and has chosen nothing but high quality appliances, glassware, dishes etc. With a designer's sensibility, each room reflects an attention to detail and beauty that you won't find elsewhere. If you are looking for a classy, dreamy place to spend a few days or a few weeks, you will not be disappointed with Windows on the Sea." "Nothing but glass and class! Windows On The Sea is the BEST! Have stayed there before, and will return! High end, luxurious, and stocked with just about everything you could want. No need to bring much with you, except an appreciation for being right on the beach with a wall of windows to watch the sea, wildlife and enjoy the sun. Cooks will love the quality cookware and utensils in the spacious kitchen...and real crystal glassware! There is nowhere better to find peace, and serenity than this condominium!" "This place is so perfect for us! Our second time around for this lovely rental. Perfect as before and as expected. Wonderful weather, especially for February! Great food, accommodations, owner attention, and especially, beach! Centrally located for all our favorite things to see and do which included north to Astoria and south to Tillamook/Oceanside this trip. We will definitely do this as many times as we can! Thank you, Denise!" "Every visit is different – and the same, like taking a big breath and exhaling with bunched shoulders relaxing and blood pressure dropping. January storm was glorious to watch – wind, water slamming the windows, waves always crashing. And then the next day, some blue skies, rainbows into the horizon – so many shades. January high tides are extreme and it’s something to see the surf well into the beach grass. The condo, so well appointed that we always can focus only on relaxing and the getting away from it all. Grandma loves the visit as did we!" "Tonight will be our 14th night here this year, our fourth stay at this fabulous condo. The weather was not always conducive to our plans of beach walks – high tides, wild waves & wind, but then again, it is winter. …. Enjoy – doesn’t get much better than this! Thanks, as always, Denise & Charles." "Just Awesome! 91 year old mom had a great time beach combing. Not sure who Denise knows, but we had to call her on a little problem, and half the town showed up. Will be back for sure." "All we can say is “Ditto” to previous comments! This is as nice as our many trips to Hawaii!! We have never stayed in a condo that had everything and more. It is like home!! We came with our youngest son and girlfriend to celebrate my 70th birthday and his 35th. Combined cooking in with eating out. Big Wave Café in Manzanita is great, as well as Offshore Grill in Rockaway. 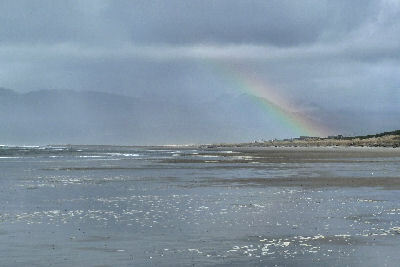 Experienced calm, sunshine, light rain & wind – but able to be on the beach every day. Our son spent hours flying his kite. Denise is so easy to work with – eager to please and attentive to her guests’ needs and comfort. We have found our new “home away from home.” We WILL be back. Thank you so much for sharing this little bit of heaven!" "We are here today – this week – for my 40th birthday & a gathering of the girls for the first time in over a decade! This has been such a lovely place to spend a week with tea, wine, knitting and enjoying the view. Kelly’s was a fun place to get fresh Dungie and we made delicious crab louis back here…. We enjoyed the sun, rain, hail & a water spout! We will definitely be back with kids and doggies. Thanks for this little piece of heaven!" "Thank you so much for sharing this beautiful place! We all do not want to leave! The view, the roar of the ocean, the beautiful yet comfortable condo. We’re already planning our next visit for next year! So until then, thanks again. See you next year! LOL"
"Denise, thank you again so much for a wonderful time! Your place is always so beautiful and peaceful. It is stocked with everything anyone could ever want or need! We appreciate all your special touches and enjoy how clean it always is. It feels just like home, only better! We really appreciate you sharing your home with us! Thanks again Denise!" "Losing track of how many times we’ve had the pleasure to have a beach stay at these condos ... but maybe the 4th time here at #201, Windows on the Sea. Best appointed and oh so cozy. Special visit this time celebrating a 94th year birthday on June 27th (thank god the elevators were operating!). Kathryn had a perfect visit seated at the window watching the waves and beach traffic almost the entire visit. Happy that this is shared with many lucky guests – us included!" "My husband Denny & I are celebrating 40 years of marriage on this three night retreat! We walked in and – glory! The heavens declare the glory and the mighty oceans roar! We have been in awe of sand and surf that seems one with the light-filled refuge! Light carpet – the color of the sand – makes one feel as if there is no dividing line between beach and condo. What a peaceful setting! The fully stocked kitchen, lovely linens, etc. made this feel like a home away from home. We have been coming to the coast for nearly 30 years. This is by far the most spectacular accomodations we have ever had. Thank you so much! It was a wonderful experience! We will be back!" "Daughters and mothers trip. We have had a beautiful and memorable trip. We love this condo – we all said we could have sat in the family room and watched the ocean all day. Loved driving up to Astoria with stops at Cannon Beach and Seaside. Also, enjoyed the Three Capes Loop. We’ll be back again! Thank you!" "First time to the Oregon coast. Beautiful accommodations. Grand baby reveal on Friday afternoon – it’s a girl! Engagement on Satuday! Wedding in the future. Old friends from Texas meeting on the coast with my new fiance! What an enchanting time!" "The Best! We have stayed at Windows on the Sea multiple times and will continue to return every time we are on the Oregon Coast. Denise is a pleasure to work with and her condo is the most beautiful we have seen. She has provided everything you could possibly need during your stay, just bring the groceries. There is no better view while making dinner, you will not want to eat out! Thank you Denise!" "The condo was beautiful with all the amenities you could want. Had a wonderful vacation right on the ocean." "Beautiful condo, beautiful location. We hope to come back this way. Loved the modern amenities & the thoughtful little touches such as coffee and shampoo. This was a wonderful 3 days, but felt too short. Next time we'll stay longer! My husband really appreciated the internet speed, direct TV & plenty of movies." "Awesome in EVERY way - a wonderful, cozy honeymoon week. Clint & I plus Viktor & Dylan (pups) thoroughly enjoyed every minute! Thanks so much for the use of your beautiful space." "This is our check out morning. We have been here for 5 days. It is hard to leave such a quiet, beautiful, well stocked condo. It rained while we were here but we managed a walk on the beach every day. The Wall of Windows is amazing! ! No matter what the weather, the view is amazing!!! It was so much fun watching our little dog explore and run on the beach – thank you for allowing pets. Loved the dog and beach towels being so handy at the front door. Privaste beach – yes – loved that too! Love everything and so clean! We will be back!" "This place is idyllic! We had a wonderful time here, and so did our dog who was in heaven. It is so peaceful and inspiring, it makes it hard to leave. As always condo is so well stocked with everything you need. The new BBQ was a wonderful surprise! Even used it in the stormy weather. This is truly a magical spot! Thank you!" "I can't say enough about how wonderful this condo is! The first time we stayed here the view took my breath away as I stepped out of the elevator! This is now our third trek to this wonderful place. Our dogs in heaven chasing the seagulls & florsom that runs along the beach in the wind. Great place to recharge, read a great book, watch the everchanging ocean waves. Whether you are headed to the beach or staying in this place has anything you could possibly need! Truly a piece of heaven. Thank you Denise for sharing your piece of paradise!" "First time at this condo – stayed on Beach Road many times in the past. Love the Oregon Coast in the winter – everything from snow to sunshine. Our two dogs loved the beach walks and beach view from the windows. Going to have to start coming back every year again! Accommodations are wonderful. Enjoyed fresh cooked crab from The Jetty twice …"
"Another wonderful stay as this amazing place. We are so grateful for this sanctuary! B Maggie the golden and Fiona the 2-year-old love the beach! The view & flying kites …. Thank you! See you in the summer!" "Beautiful condo and view! You couldn't get closer to the beach. A wall of windows right above the beach grass. Light and bright, well appointed with a gorgeous kitchen. Great place to relax and enjoy walks on the beach and watching the sunset. I always enjoy staying here!" "Beach is right outside the front windows, with the added benefit of an elevator to transport luggage & essentials to the second floor unit. Path to the beach is easily accessible & our two dogs enjoyed their many walks each day. Plan to return on a yearly basis." "Delightful, unexpected change of plans. I got Rockaway Beach confused with Manzanita after our last year's Valentine trip to Cannon Beach. When making plans for this year's trip, I thought I'd made reservations in Manzanita. When our GPS navigation took us 20 miles further south, I realized I had gotten the wrong community (we did visit Rockaway Beach last year to find the cute white church antique store). We are so glad I got confused! We had beach to ourselves. It was quiet and wonderful. Weather was perfect. We had a wonderful day trip visiting each of the 3 capes. And the accommodations were so perfect for us and my sister and brother-in-law. We decided we could satisfy our Cannon Beach/Haystack Rock/Mo's visit enroute to Rockaway from now on and leave the crowds behind :)"
"This is a great condo with the most fabulous. unobstructed view of the ocean right in front of you. This trip is our third to this unit in the past two years and are so impressed with the amenities we are reluctant to try anything else. It has an elevator that opens up to a spacious living area or you can use the stairs. Modern kitchen area with open concept and tall ceilings and tall windows across the living area. A great getaway for a couple, so peaceful and quiet the only thing you hear are the sounds of the surf. The area is great with different small towns nearby to explore and sample the area cuisine makes it fun. The beach area is wide open with very few people and a lot to explore without the crowds. We highly recommend this unit." "Couldn't stay away from our favorite getaway! Whenever we're feeling a little restless and need to get away from it all, Windows on the Sea is our go-to spot. It's simply the most beautiful, relaxing place we know, and we feel very lucky to have discovered it. We're getting to know our host, Denise, more each time and she's always been so great to deal with. The place is sparkly clean and has everything you could imagine needing or wanting, and we only have to show up for the show outside those amazing windows ... Thanks Denise for another perfect stay!" "True Oregon coast treasure! What a delightful way to experience winter at the Oregon coast (it's even sunny!) My husband and I travel extensively and have high standards for the places we choose to stay. This lovely condominium exceeds our expectations each visit: spectacular oceanfront view; beautiful and comfortable interior; generously stocked kitchen; convenient elevator; thoughtful, detail-oriented owner who thinks carefully about the guest experience. Thank you Denise for providing such a tranquil haven and inspired get-away!" "Perfection x Three. This is the third time we've rented from Denise: May 2012, January 2014 and just had two weeks in January 2017. I don't want to give her a 5-star rating; I want to keep her and her lovely condo to ourselves. Denise is extremely responsive when making reservations and follow-up. This condo is simply -- lovely. Tastefully decorated with subtle colors. Who can beat those floor to ceiling windows with the view of the ocean right in front of you, let alone the ability to dash down the steps and be walking on the beach in a heartbeat? Windows on the Sea has always been immaculate. The furnishings are comfortable (except maybe for that dining room table that I can't cross my knees under), including the beds and linens. She always seems to have the fluffiest of towels, I swear. The kitchen is extremely well appointed. Appreciated having the coffee, butter spread, olive oil, misc. condiments, plenty of spices and more. Never a shortage on paper towels, t.p., shampoo/conditioner, Kleenex, hand and dish soap, body lotion, foil & more. And having the washer & dryer is a plus, especially when you get hit by the incoming tide and soak your pant's leg! We've never had anyone stay with us but it certainly would be a FUN and beautiful condo to share with another couple. Thank you again, Denise." "The perfect place to relax and feel pampered. We stayed at Windows of the Sea for a week, arriving in Portland just ahead of the ice storm. I was impressed when I got a note from the owner encouraging us to head out there a day ahead of schedule to miss the bad weather. So generous and thoughtful. We did not heed her advice, however, as we had errands to run, but the next day was decent weather. The condo is so comfortable and beautiful with all we needed to relax and enjoy our stay. As everyone has noted, the kitchen is very well stocked and you can tell the owner wants her renters to have a wonderful time. I felt pampered. And walking into the hall every morning to the ocean view is breathtaking. We had a dog so were very glad to have a dog friendly condo. There are not many. We have good friends considering a trip to the coast and I would not hesitate to recommend this condo as the best choice." "This is the perfect spot! We hit the jackpot when we found this place. The whole place is well done. I was concerned about it being a condo, but its a very quiet place and you can't hear the other residents. It doesn't feel like a condo at all. We've stayed with our two young kids and dog and its very comfortable. It really is just like the pictures. I wish my house had bathrooms that nice! The view is spectacular and so relaxing. The beds and pillows are very comfortable as is the other furniture. You can tell the owner cares about the home and guests. There is direct beach access which I also like. I am very picky about where I stay at the coast because we are able to make day trips for free. You couldn't ask for a better place. Plan your stay ahead though as it stays pretty full. It has an elevator to the condo, but if you require an elevator due to physical limitations, contact the owner to make sure it is working. She is very easy to communicate with and will answer any questions." "We couldn't of picked a better condo to rent. It was right on the Beach with beautiful views and steps away from the sand. The accommodations were excellent as well. If you're looking for a great place on the beach this would be it!! "Fabulous Place! We had a great stay at this property. It is a beautifully appointed condo, with everything you might need. We did a lot of cooking there and the kitchen had many pots, pans, spices, utensils, etc. that made it easy. The views are unmatched. Those huge picture windows let in a ton of light and scenery. We are a very active couple and besides beach walking, there is very good hiking not far away from this condo. We also like things quiet, and this place was very peaceful. We can't recommend this condo enough!" "Still the best of the best! This was our second visit to Windows on the Sea in Rockaway Beach, and it's even better than we remembered. We travel a great deal and have rented dozens of places at the Oregon coast over the years, and this place remains our hands down favorite. The relaxed, lovely atmosphere is so clean and open it makes you feel at home the moment you walk in, and the jaw-dropping view is unbeatable! The owner, Denise, is a delight to work with, and responded quickly and cheerfully in every exchange, and was very helpful with planning a special dinner. We have never seen a rental so well stocked and supplied, she really has thought of everything! This kitchen is better stocked than our own with high quality cookware, etc. and, many, many spices and condiments available for our use. Unlike most rentals, the quality of the furnishings, linens and supplies is very high, not a jumble of leftover 'stuff.' From the portable beach cabana to the huge DVD library, gas grill and black-out curtains in the bedrooms (a recent addition), everything we might have wished was there at our fingertips. The elevator (the only one that works in the complex), was a real plus! We really enjoyed our long peaceful walks and a roaring fire on the beach one evening, and most of all, just relaxing in the cozy living room watching the birds and the waves. We so appreciate this perfect gem, we will absolutely be back again and again. Highly recommended!" "Perfect place. Windows on the Sea is an appropriate name for this wonderful place. Family of 4 enjoyed all the amenities provided as well as staples provided. We cooked in each night of our stay. Measuring cups, measuring spoons, paring knifes a few of the things not found in most rentals are provided here. Beach access is easy, as well as many miles for beach combing, and there are very few people out even on a busy before school weekend. Fantastic find and highly recommend Windows on the Sea to anyone." "Absolutely wonderful! From the time I first contacted the owner about this property a year ago, to the time we checked out, everything about booking this property and staying there was perfect. It seems she has thought of everything a guest could want or need and it was all in great condition: towels, utensils, sheets, etc. The condo was spotless, as if we were the first people ever to stay there. A few hours before we arrived, Denise called to let me know that something was wrong with the TV. She arranged for a new box to be sent from DirectTV, but that didn't solve the problem so she drove all the way from Portland to bring us the TV from her own home to use for the week! We were really impressed with how much she cared about making our stay nice. The view is incredible. The photos don't do it justice; it's even better in person. We will definitely be back and wouldn't want to stay anywhere else in Rockaway Beach now that we've experienced Windows on the Sea." "Love it here! This was our second stay at Windows on the Sea and we will hopefully be returning many more times. The best part of staying here is the magnificent view of the ocean and the proximity to the beach. It truly is a perfect location – so peaceful and relaxing. It's also wonderful to be able to bring our dog to such a beautiful place. There is one major problem though. Once I'm here I never want to leave..."
"A healing bit of heaven. My husband booked Windows on the Sea for the day after I concluded a 2 year long intense, exhausting creative endeavor. He knew I would need a place where I would feel nurtured. Arriving to a room with a wall of windows where all you see is vast ocean was the first great gift of Windows on the Sea. Add to that a well appointed kitchen to make delicious dinners, super comfy bedrooms and lovely bathrooms that were spacious and clean. It was such a luxury to bring our dogs and not have to compromise the quality or esthetic of our accommodations! It was the best thing in the world to lay on the floor with them, the sun streaming in and then bounce down to the beach immediately outside any time we felt like it! I was concerned at first that there was no fireplace but the second I voiced that concern a twinkling bon fire appeared down on the beach! Magic! It couldn't have been a better place to reflect and regenerate. We did leave a few times to drive around and explore but kicked ourselves each time! Why leave? We had the best view on the beach! We will remember that next time. I hesitate to share my enthusiasm for this special place because I want it all for myself!" "Nothing but Accolades!! Over the past 20 years we have stayed in many rental places along the Oregon coast....some good and some not so good. I have to say that Windows on the Sea was (is) by far the best of all! The number one reason is probably the location. You can't get much closer to the beach than this, and you'll never find a better view! Denise has put every imaginable thought into her place to create a luxurious environment which you don't want to leave. From the moment you first step off the elevator and look out the wall of windows you know you found the right place! Everything else is just icing on the cake. Already looking forward to going back!" "A true Rockway Beach GEM! I hesitate to write this review only because I am selfish and want to keep this little gem all to myself. First the location, it's a quick walk over a small sand dune to the beach/ocean, this is a true oceanfront property, no rock climbing. Rockaway Beach is a charming little town located just far enough away from the touristy towns that you can enjoy their shopping but then come back to Rockaway to relax and get out of the hustle and bustle. The beach is beautiful, fine sand, not a lot of rocks or people and always a source for whole sand dollars, small agates or sea glass. The three times I have been to this location the wind has been minimal, enough for a good kite flying but not so bad you have sand in unmentionable places. The condo is beautiful, very tastefully decorated and I think it has the best view in the small development. I have stayed in one other unit and this unit hands down beats it in every way. The kitchen is beyond well stocked, with nice pots, pans, plates, glasses and more than the basic pantry needs, from Trader Joe’s no less. The spice cupboard looked a lot like my own. The appliance are in excellent condition and seem very new. The beds and bedding are top of the line, I sleep so peacefully. The owner has really thought of everything to make your stay comfortable. Big fluffy towels, nice shampoo and conditioner, excellent coffee, games, books, videos, even dogs toys. This condo is better than a 5 star hotel and we will be making many trips back. Enjoy!" "Windows on the Sea is our new favorite destination! We stayed here as a family for 5 days at the end of March and were we in for a treat! We had an amazing week at your beautiful property and enjoyed every minute of it! First, your private elevator deposits you into the kitchen and spacious living room which has the most gorgeous and amazing views of the ocean you could hope for. You are greeted by a modern, well appointed kitchen, comfortable bedrooms, beautiful bathrooms and instant access to the beach. I'll never get tired of waking up, coming out of the bedroom and being greeted by the surf and sun at the end of the hallway. Spectacular. It was so relaxing after doing activies during the day to come home and just drink in the intoxicating view of the ocean and the sounds of the surf. Beautifully decorated, every convenience and comfort are provided by the owner who makes you feel at home from the first time you talk. We love to cook and when my daughter wanted to make creme Brule for an after dinner treat one night, there were even ramekins for us to use in the kitchen, every conceivable need has been anticipated. Truly a spectacular and memorable week at this amazing rental! We will be back many more times!" "Whales spouting one evening, seal watching the next. Dog had his first time in the surf. Warm days, clear nights! Wonderful. Thanks for making this place available!" "It doesn't get any better than this! This condo is so very superior! Beautiful décor and furniture, excellent kitchen with every utensil you could possibly need. The VIEW is spectacular....constant ocean view seen through a wall of windows! The elevator makes it so easy to transfer all your luggage and groceries up to the condo. Huge soaking tub in the master, large walk in showers in both baths. Besides the view being the BEST ever....it's very quiet and private at this condo. So if you want a peaceful get away, this condo is PERFECT! Immaculate, and did I mention we LOVED it?" "Talk about lucky – we decided on Tuesday that we needed to squeeze in a couple days at the ocean. How fortunate that your place was available. Absolutely lovely! Sotrmy bech, sun breaks we were able to experience it all. With the weather changing by the minute, we could run out and come back and enjoy he ocean both ways – on the sand and comfortably from the couch. Such great light! We truly enjoyed our stay and hope to be back soon. Everything was wonderfully provided, tastefully decorated, and great quality. Thank you for sharing such a wonderful place." "The three best things about this cozy getaway is the view, the view, the view. You are literally right on the beach at the second story level and, did I say, the view is amazing. Sunny, stormy, rainy it doesn't matter. The dance of the waves and sand and birds and horizon will draw you in and cleanse your soul. On the practical side, the place is very clean and well stocked with cooking items, fresh dried spices and more. The beds are comfortable and everything works. You can tell the place is owner operated with care." "We thoroughly enjoyed our stay at this very clean place. We loved the view and the easy beach access. We will definitely stay again!" "A perfect spot in a perfect place. Literally right on one of the best beaches of many gorgeous and long beaches in Oregon. Take the elevator - which stops right inside the condo - and walk out to the beach, Superb layout, very well furnished in nice style. Very well equipped kitchen and bathrooms. Spotlessly clean. Very comfy beds. High quality TV and accessories. The whole area doesn't have any high quality restaurant except the Rising Star in very nearby Wheeler. All of which makes for a great week or few days of walking and running your dogs on the beach, reading, and relaxing while cooking up what you like to eat. We have rented spots all over the world for decades and this is an excellent one." "We wanted a comfortable, hassle free, warm place on a great beach, so our two standard poodles could run wild while we did nothing but watch the tube, read, and sleep. We found it! A friend who stayed here described it to us; she was right on all counts. Stylish, sunny, warm, incredibly well furnished, everything anyone would need, and everything works. The only thing missing was a recommendation to go to the Rising Star in nearby Wheeler for dinner. It was superb! We won a rental condo in Palm Desert and travel the world and have for 30 years. This was as restful and as comfortable as I can remember. The dogs were exhausted by their coast to coast running and we all slept like babies. Well done." "Denise, our 3rd year celebrating our anniversary in your comfy condo. Everything was fabulous and we enjoyed walking the entire beach every day, no matter the weather. All I can say is, our 31st anniversary was a hit !!! Thank you for sharing your beautiful condo with us." "We had a very rough 2015. We came here to start off the new year right. It’s a beautiful place with very nice amenities that a lot of beach houses don’t have. We love it here and have only been here for less than 30 minutes so far! We got married in Rockaway in 2012. We come back often and plan on coming to this condo again. We have stayed in many of these units and this one is already a favorite." "Thank you so much for offering a clean & clutter free space at a reasonable price while also allowing dogs. .. This is a very rare find – our very mobile & independent 8 month old daughter and 2 friendly dogs so greatly appreciate this!!! Your home is warm and inviting, it was so easy to make ourselves at home. Also, thank you for all the good notes to help us care for everything properly. The view is wonderful, the time is relaxing, the home is quiet as (well, aside from the chatty baby) & warm. Thank you deeply." "We love this place! It was my retirement gift from hubby to have a few days @ the coast. He found the perfect place! So beautiful & such quality furnishings and supplies in the kitchen! We were especially pleased that this is a pet friendly home. Barkley thinks he went to Doggie Heaven with the fun beach and great windows to watch the waves. We will be back!!" "Awesome! Stayed here for 3 days. Absolutely loved it. The pics don't do the condo justice. Everything was top notch. Elevator comes right into the condo, that was a bonus and a surprise. Right on the beach, fabulous views. Kitchen fully stocked as are bathrooms. Beds are very comfortable.. Quiet. I almost hated writing this review as I wanted to keep it as my little secret. Our new oasis. Coming back in Feb and hopefully May and August and hope to do this 4 times a year. The condo is a smaller version of our own home, so we felt right at home. Our dog loved it too." "What a wonderful get-a-way! We were surprised at how lovely the condo was kept. We felt right at home. Great night’s rest, visit with friends, the beach, food and shopping. We thank you Denise for your home. Will be back in May. PS – we made our reservation for next year within minutes of walking in!" "Wonderful place, felt right at home. Enjoyed relaxing & watching the waves. We will be back! One of my best birthdays." "Thank you for letting us enjoy your beautiful home! We can’t imagine a more perfect place to spend a relaxing weekend. We happened to be blessed with beautiful weather this weekend, but we look forward to coming again for some storm watching. You have a truly beautiful home! And our dog really loves his view from the windows, watching the beach below! Thank you from Scoaly too!" "The condo is wonderful! I have had a wonderful time exploring the Oregon coast. The condo had been so quiet and I’ve spent a lot of time just relaxing, which I really needed! I recommend Offshore Grill & Coffee House for breakfast. Big servings and great service. The halibut fish & chips at the Beach Bite is also tasty." "Three sisters came for some time to visit. One from Portland, one from Ashland and one from Sweden. Good time had by all going through old photos, seeing the area up to Astoria. Loving the ocean!" "What a wonderful place! Spent five relaxing days at this beautiful condo on the beach. The pics are great, but the condo is even more lovely in person. The view of the ocean is spectacular and the beach is so close. At night, I was able to walk out on the beach and I could see the Milky Way. Even though there were visitors in the other condos, it was very quiet and I never had any issues with noise. Everything you need is there for you - all you have to do is buy groceries! There was one housekeeping issue and the owner immediately took care of it and showed me that she really does care about the renter's experience. I am so glad I found Windows on the Sea - it was just perfect! Should I ever venture back to the Oregon coast, this rental would be my first choice!" "Peaceful, relaxing, beautiful. This condo exceeded our expectations. Quiet. Easy access to the beach. Great ventilation. Well equipped kitchen. Easy base for exploring north and south areas of the coast. Guest welcome book provided a wealth of information for exploring the area." "Windows on the Sea … What a beautiful & accommodating place, everything we needed! Thank you so much for sharing!" "The pictures don’t do justice to this beautiful place! Love the sound of the sea and the full moon reflecting on the water. Peaceful place! Your welcome book is the most interesting & informative I’ve ever seen.. We had a lovely relaxing week. The time flew by. Hard to leave this beautiful spot. Thank you!" "This place is beautiful! I knew the elevator was broken when I made the reservation and didn't care. What I didn't realize was that the elevator goes directly into the room! It was fixed just as we were leaving and that is the only complaint I have. The maintenance men just opened the privacy door to our room without knocking, while working on the elevator. Other than that, this place is perfect-by far the nicest property in Rockaway." "Awesome! Beautiful condo (is just like the pictures look) steps away from miles of a clean, quiet beach. Windows open 2 ways so you can hear the waves and smell the ocean. Dogs allowed at owners discretion. Saw lots of dogs on the beach. Everything you need in this condo to have a great vacation whether you eat in or out. Close to local shops including groceries. Quiet, secure, covered parking. In-condo laundry, elevator, and cleaning equipment. My friend of over 50 years and I had a super time!" "We are very pleased with this choice of condo/house for our family vacation. The orgon coast is very relaxing and have many “things to do.” In the area,-- fishing, horseback riding done on our bucket list, and yes, we got plenty wet and has lots of fun with the ocean & beach. Thank you Denise, we had a relaxing time." "Thanks so much for sharing your lovely vacation home with us and our friends.. We were overwhelmed with the comfort and cleanliness. We will definitely come back and recommend to our friends." "This place was truly Heaven on Earth!! My husband,14 year old daughter and I had the best time in this beautiful condo! Everything was very clean and beautifully decorated. Everything you could ever need was already in this place. All of it was of very good quality and "Top Notch" in my opinion. The place really felt like a home away from home. It was very quiet, private, and very, very clean, which I loved. The master bathroom and tub were wonderful and we never ran out of hot water. We really enjoyed cooking in the beautiful kitchen while enjoying the incredible views! The beds, couches and chairs were all very comfortable and we felt so much at home. Denise bent over backwards to answer all of our questions. She responded promptly to all of our emails. Thank you Denise, for sharing your beautiful place with us. We hope to come back again, in the not too distant future to enjoy your beautiful condo again and another few days of " Heaven on Earth". Thank you also for all your attention to the smallest of details! It is greatly appreciated!!" "Thank you so much Denise, for a wonderful time! The place is so beautiful, definitnely “a 5 star experience.” Thanks for all your special touches and attention to detail. It was fun to come back home and enjoy it in your beautiful condo. Our new favorite spot is on the carpet underneath the main windows. The sun streams in beautifully there J. What a great view! Thanks for everything. We can hardly wait to come back." "What a great place to relax! It’s so sunny & bright inside I almost felt I needed to put on sunscreen! And I have to say this king bed is one of the best I’ve slept in over the years of our travels, staying in cabins & condos in the Northwest. (I’m going to buy those 540 thread count Kirkland sheets when I get home!) I do wish there were some dark curtains in the bedroom, though, because I kept waking up at 5:30 am! I do love your accommodations in the kitchen because we cooked 3 or out 5 nights here….. We didn’t do much but run (sometimes on the beach), watch DVD’s, listen to music, play cards, drink wine, cook and read, and Windows on the Sea was the perfect prescription for what we wanted. Thank you!" OWNERS NOTE: Black-out shades have since been added to the bedroom windows. "Awesome! More beautiful than we imagined. So great to be able to have the dog too – she loved it." "So enjoyed getting out of HOT Portland! Cdelebrated grandma’s 92 birthday and daughters college graduation. Had a most wonderful stay – best appointed condo, and the view is priceless. We’ll be back!" "Our 2nd time at the most beautiful place. We love the condo and WOW what a view! Bummer the elevator didn’t work, but Denise had staff here to assist in packing things down. The weather wasn’t bad overcast. We went down on the beach three times. Our puppy turned 1 year old this trip. She is still afraid to get in the water. Course she hates her bath. We used the BBQ several times. Good eats. Plenty of great places to eat. We always go over to Mo’s at least once. I love laying on the love sear and having a window open to listen to the ocean. We will return for a 3rd, 4th, 5th, etc. time! Thank you for sharing your piece of heaven, Denise. You are awesome! See you next year!!!" "Windows by the Sea is the perfect name for this condo. Floor to ceiling windows that let you enjoy all weather right at the ocean. It is by far the best location for privacy, convenience in parking, beach walking and realty experiencing the Oregon Coast. There is even an elevator from the garage in to the unit. Then, the owner supplies you with everything you need! All condiments, lotions, shampoos, soaps for hands and machines, DVDs, books, puzzles and even a closet with chairs for the beach, kites, rain boots and jackets if you need extra! She also has a book that she created with info on everything about the unit and surrounding area. She is by far the most thoughtful owner I have dealt with who thinks of all needs for her guests! Thanks Denise!" "This was our third stay at Windows on the Sea. It is so wonderful to come in the door and feel we are arriving home. Never get tired of just staring out the windows. Brought our new puppy Ripley and he got to experience the best dog TV on the coast. Thank you for allowing our pets to be a part of the beach. It wouldn’t be the same without them here. Everything was spotless as usual. All in all a wonderful relaxing stay. We will be back soon!" "Denise, you and your beautiful condo are amazing! Thank you so much!! This was everything we were hoping for & then some! You, sweet lady, think of everything!! The BOOK, supplies, dvds, books to read …. You really think of everything! The extra jackets were such a surprise and help on those chilly walk days! We just loved it all!! Thank you so much!! We would love to come back when our daughter starts school at PSU!! God bless you and yours. Mathew 11:28 … “it fits here well (heart)." "Your condo is spectacular – well thought out with attention to detail. You name what you're looking for and you'll discover that this condo has it.....prime location, floor to ceiling windows that give you the feeling that you're at one with the outdoors while being warm and cozy inside, and such attention to detail that there's hardly anything overlooked. We rented 2 condos here, and even though most of us had grown up in Oregon, we had not been aware of the expanse of Rockaway Beach – a well kept secret! We hope to return again to your lovely home!" "We stayed for a week and really had a great time. My family (14 of us from 7 states from Alaska to North Carolina) stayed in 4 Nedonna Views condos (this one was the best!) Surprised me for my 60th birthday. My husband and I arrived at 10:30 pm last Saturday night. The beach was dotted with bonfires. We joined my daughter, son-on-law and grandson at their fire. Seth started singing one of my late father’s favorite songs – “On the Road Again.” Soon people from the next fire came over to join in. It was dark so it took a few minutes for me to realize that the group was my family! We had a great week at Windows on the Sea! My favorite birthday!" "Great place - all we had hoped for.The main building is elevated so that all units have a beautiful view of the beach & water. Our unit probably had the best view of all. It was spacious, clean, and very comfortable, complete with clothing washer/dryer, a large refrigerator, and everything we needed in the kitchen. There is ample and convenient parking vehicles. The ocean side wall is all window & glass making for awesome sceneary while indoors. The beach is 15 yards away and not at all crowded. We enjoyed long walks in the smooth sand daily. We had no hassles and nothing but great memories. "Exceptional condo with exceptional views! The condo felt like an oasis the moment we walked in the door. It is beautifully decorated and the gourmet kitchen was very well stocked. The beds are very comfortable with luxurious linens. The elevator iwas out of service but the two flights of stairs were not a problem. We watched whales, kite fliers, and dogs with their humans frolic on the beach below the condo. The respite was just what we needed! Thank you, thank you for allowing us to live in luxury for our brief stay on the coast. We would definitely recommend the "Windows on the Sea" and hope to return again and again." "Two words: The View. Bright when you walk in, you either see a bright morning or a beautiful sunset that lights up the whole room. Staying here has been wonderful! I had the luxury of sleeping on the couch facing the beach at night, and boy was that gorgeous! The condo is full of amenities and entertainment which is a big plus. The location couldn’t have been better for it is right up on the beach and it is just a minute’s drive to local seafood stores that provide delicious crab and oysters. We are very glad that we have chosen this place and hope to return in the near future." "From the minute you walk in you feel a sense of peace wash over you. We’ve stayed in many places but this was my favorite. The condo is so tastefully decorated and reflects the colors of the sand and the water. The kitchen has everything you could need and what a view! Monday was a sunny, warm surprise, Tuesday was the same. We stayed in Wednesday and watched the sand blowing while people on the beach attempted to launch kits with the wind blowing at 20 PMH. As the day turned to night we realized the storm had blown itself out and the moon and stars were visable. Such a beautiful sight to see moonlight relected on the water. Today is departure day. As much as we would love to suspend reality a little longer, we extend heartfelt thanks for this time of respite." "Why O’Why must we leave? In two short days and nights we have spent more family time, beach time and personal reflections/relaxation time than we normally do in a week spent at a hotel or campground. We loved being here. Thank you so much for providing such a wonderful place!" "Rockaway beach in the off season is a great place to unplug, unwind from the daily pressures of life and to kick back in a very clean, quiet, and peaceful environment and soak in the solitude and ocean presence. The condo is very well built to reduce any surrounding acoustics. We never hear any of the neighboring units. We enjoy being able to just drop down and be on the beach. Go for very long walks, the sunsets are beautiful, the local culture is quite quaint. Denise does a great job ensuring the basic amenities are provided to ensure we get off to a good vacation experience. Thank you, we will return!" “Beyond expectations! I recently stayed in the condo with my two children and puppy! It's super easy to find and I was pleasantly surprised upon my arrival! I've stayed in a lot of condos... from WorldMark to Rei! I can honestly tell you that this place I refer to as my gem in the sand! The open windows which show the amazing view of the beach was fantastic! Everything was provided in this condo..my daughter loved the sand toys for the beach! I cannot say enough good things about this place! I was posting pics on Facebook and my friends all wanted to know the name of the place! It's just that great! I was very worried about the white carpet but since we don't wear shoes in our house it worked just fine! We had a blast! I even found her very informative notebook with activities listed so helpful! I looked up a nice hiking spot using it! This town is seriously dog friendly..we found it super easy to bring her with us every where! The beach access is right out your door and I found myself able to watch my two kids play on the beach while I made breakfast! You can't beat that! The service was top notch! I can't find anything wrong with this place and I'd joyfully recommend it to anyone! It's perfect!" "Our stay at the Windows On The Sea was very relaxing and enjoyable. The elevated second floor unit has a straight on view of the ocean are fantastic. You are just a few steps to the sand for an enjoyable walk. This unit has an elevator to your door but was not working during our stay but we were informed of this when making the reservation. The owner mentioned this situation should be remedied very soon. Be forewarned there are 40 stairs or so from the parking to the front door. The unit is furnished to the max with everything you need except your groceries. The king bed in one of the rooms was very comfortable. There is a couch and loveseat in the main seating area which are comfortable. The kitchen area is stocked very well with high quality items. I recommend this unit highly for a quiet and peaceful retreat with unobstructed views on the breaking waves and activities on the beach." “Peaceful paradise! We just left the beautiful condo that Denise owns at Rockaway Beach in Oregon. This was our second stay and we had the time of our lives. When that elevator opens up into the condo with that spectacular view, we are just simply blown away. We having been coming down to the Oregon coast our whole lives and we have never stayed at a nicer place. Everything and I mean everything is there. From every pot and pan, hair dryer, shampoo, doggie towels, nice top of the line bedding everything is at your disposal. All you need are clothes and food. You don't even need to bring very many clothes because there is a washer and dryer. The condo is super duper clean and close to the town to pick up groceries. I almost hate to write a good review because we want to keep the place our little secret, so don't tell to many people, you will know what I mean when you visit. Did I mention the beautiful view ! If you decide to stay here we hope you have as much fun as we did." "Serenity. What a picture perfect getaway! Quiet, spacious and warm with sunshine, our winter stay was too short to fully enjoy all the amenities of this beautifully appointed, immaculate beach spot. Located just steps away from a large open beach great for walking both you and the dogs. The kitchen is up to "foodie" standards with everything you need to cook and dine. Heading back soon!" "Perfect ocean front getaway. Perfectly appointed condo and perfectly located ocean front setting. Just bring your food and loved ones and enjoy the get away -- storm, rain, or shine." "A treat and bargain in the winter! This is a very nice beautiful place to stay at the Oregon coast! Definitely a treat with the features and feel of a 5 star resort - a soaking tub, granite kitchen, floor to ceiling waterfront windows, dvds for the flat screen, privacy, well-appointed and clean. Very much a treat and certainly a bargain at the current winter prices!!" "BEAUTIFUL FEELING, fabulous resort, good to stay away from the noise of the city. It's 100% worth it!" The condo and our stay were enjoyed thoroughly! Than you for making your lovely condo available for dog owners. It was a treat to stay somewhere as clean as home with Jaffa along. All the extra touches were appreciated: bathroom baskets, nicely appointed kitchen necessities, shoe rack, pet towels, and the huge tub. We certainly hope to come back!" "What a well-appointed vacation condo in the perfect spot! Thank you for sharing it. I’ve stayed all along the coast for the last 40 years and this is BY FAR the best! I’m spoiled now and wouldn’t want to stay anywhere else! The location is wonderful to relax in and enjoy. We enjoyed watching our dog experience her first beach visit knowing the unit was prepared with dog towels and tile right inside the stairwell door. It was especially nice taking our dog somewhere that was just as clean as home. Preparing meals was a cinch with a wide variety of herbs, seasonings, and cookery. This particular unit is well suited for anyone that cannot physically manage the beach, yet still would like to enjoy it. The elevator opens directly into the unit and the owner has provided a good sized flat cart for transporting personal items from the parking area. And of course, the floor to ceiling windows and small lanai area provide a birds-eye view of the beach and waves. These benefits also help if the weather would be more fun to watch than walk in. The quiet of this town has always been a draw for us. We always drive out to our favorite spots: Tillamook's Cheese Factory, Debbie D's Sausage Factory, and Blue Heron Cheese & Wine Company; Garibaldi's Bayfront Bakery & Deli; Cannon Beach's Pizza a'fetta and the Northwest Gallery right next door as well as Mo's Restaurant for chowder. This year we actually caught the Cannon Beach Farmer's Market and got some fresh produce and flowers. Of course, you don't really need to go any where! Right in Rockaway there is a great breakfast spot called Offshore Grilling, coffee and scones at Dragonfly Sisters on weekends, the quaint little grocery store [great bacon], and the amazing Flamingo Jim's for those special souvenirs. We WILL be back - hopefully sooner than later. We would highly recommend this vacation condo unit for all it offers. Happy Beaching!" "Perfect Place to see the North Oregon Coast. We enjoyed every minute of our stay at Windows by the Sea. Denise was very easy to work with and made us feel as if we truly were a guest in her home. The view is stunning! The open kitchen living room great! Bedroom and baths were very nice. The fact that you have access to beach chairs, boots, well stocked kitchen, etc. is just great. We liked the Rockaway Beach location because we could take daily trips both north and south to see the coast. We traveled to Astoria all the way down to Lincoln City, stopping for multiple hikes all along the way. It was a great week and we hope to be back again. We definitely would stay here again!" “Amazing! My family of 5 (and our dog) had a great vacation at Windows on the Sea. Everything in this clean, comfortable well stocked condo is as described and more! And, all matters from booking to check-in to checkout were clearly and professionally managed. The beach was exactly feet from the front door so you can enjoy as much as possible of the beautiful Oregon Coast!" " Graced experience all. Accommodations compelte with all the amenties. (You were right about beging well-stocked! )( and we had the most incredible weather with a lot of sun and very little wind, just cooling breezes…." “Amazing Place with Great Ocean View! We have stayed here twice now, we absolutely love it. It has all the amenities that we need, especially traveling with kids. When we are not down exploring/playing on the beach we are sitting in front of the windows watching the waves! “Perfect beach vacation even in the middle of winter. Even in winter, this location is spectacular. The beach is enormous, without too many people, and right on your doorstep. We took long walks every day to drink in the sand sea and sky. The rest of the time we cozied up inside with movies and books and cooked elaborate meals in the well-stocked kitchen. We had planned to go out exploring the local area more - but it was so nice being in the condo and on the beach that we didn't want to leave! Looking forward to scheduling our next visit. "WOW!! This place was AWESOME! Thank you Denise. We absolutely had a wonderful experience from you in coordinating this trip. The condo was immaculate and the location, we could not have asked for a better setup. This trip was scheduled to celebrate both our birthdays and to provide my love her first sight and experience of the Pacific Ocean. What a fantastic way to initiate someone to the Northwest. The location at the far end of town was ideal for us as we enjoy privacy. The condo was constructed with that in mind as we could not hear anyone else around. Open the windows and let the breeze, sea air in and it... Ahhh, total relaxation. The condo is well equipped with all the amenities, much appreciated. We popped up the beach to a local marina and bought live crabs for a feast, YUM!. We are very much looking forward to coming back and will absolutely check with Denise Richards 1st for our accommodations. Thank You Denise. “Best vacation we've ever had! We had the best time ever!! Well stocked, I didn't need to bring a thing. Very relaxing and beautiful view. The beach isn't very crowded and the whole family had a wonderful time. We can't wait to go again next year and stay longer!" "AMAZING!!!! Thank you so much for letting us stay at your beautiful getaway on the beach! We had the most relaxing, fun time here. We found many sand dollars, crabs and even a starfish on the beach. Everyday the kids found a new treasure! The view was amazing. This is a trip we will never forget. And this will not be the last time we stay here. Only next time we will stay longer!" "Thank you so much for sharing your beautiful place with us. You thought of everything. We had a fantastic week here that seemed to fly by." "Thank you for sharing your wonderful spot at the beach with us. We have spent many vacations on the coast over the part 30 + years and this is by far the most panoramic view. It’s like the room and the beach lend seamlessly into one another. The dog enjoyed his many hours of dog TV watching the everchanging activity. We saw whales (almost daily), eagles, pelicans, seals and a multitude of dog breeds. We’re loking forward to returning in the fall to celebrate our 30th anniversary." "We truly enjoyed our stay here and hate to leave. Thank you so much for making it so comfortable and easy. The view!" "Windows on the Sea is exactly what I titled it, "a little slice of heaven!" The condo is beautiful, very clean and inviting and made to feel like home away from home! It is supplied with several wonderful amenities! The view can't be beat, with the floor to ceiling windows with the beautiful ocean view. It was wonderful to hear the ocean and be only steps away from the beach! Sometimes it felt as if we were the only ones there! The beach is one of the cleanest we have ever experienced! We lost the WIFI connection on about the 3rd day and we called Vacasa and it was immediately taken care of so we had access again. The customer service can't be beat! We would highly recommend Windows of the Sea to all our family and friends! "Yippee... Vacation time is always something we look forward to. To find a beautiful, relaxing beach front place to stay can be a tough.. especially with a dog. This condo was just perfect for us. The beach, the view of the beautiful sunsets and a fun little town was a super plus. This condo has everything you could want in a fantastic and private stay. We will be back soon." "What a fabulous home you have! Your attention to detail is so welcoming and the fact that you allow pets is deeply appreciated. The sound and view of the ocean is dreamy – thanks so much for sharing this wonderful place! It was awesome to see 2 bald eagles on the beach today!" "What a wonderful home away from home! We were very comfortable here and enjoyed watching the waves and changing surf every day. We especially appreciated the well stocked kitchen as we took advantage of all the local seafood markets and cooked in every night while watching the great sunsets." "We very much enjoyed our week at Windows on the Sea in March. We have rented numerous condos and houses through the years, and this was the best stocked kitchen we have ever seen. The location is perfect, with views up and down the beach, and the beach access is wonderful. We highly recommend this vacation rental." "Windows on the Sea -- Perfection again! I wrote a review and submitted it and perhaps it was rejected because I had entitled it the same as the review I wrote on May 19, 2012: “Windows on the Sea – Perfection”. Denise could definitely teach some owners of rental condos or homes a thing or two. What you see/read on her website and what you receive at her condo is right on the money. We had coffee every morning courtesy of Denise, butter spread, condiments, and a plethora of spices and cooking oils for our use (which we did, as we ate breakfast, dinner and most lunches in for our 14-day stay). There was no shortage of paper towels, shampoo/conditioner, body lotion, hand and bath soaps, Kleenex, or detergent, etc. for the washer/dryer unit. Her bed linens and bath towels are plentiful and of high quality. Denise is amicable and professional to deal with. She even checked in on us partway through our stay to see if there was anything we needed. She even managed to turn part of January into “Juneuary” as the temps on the beach were 63 – 65 degrees at times! The water views are spectacular and Rockaway Beach can’t be beat for walking, that is, if you like solitude! We saw so very few people on this stretch of beach, even on the weekends, and we loved it. If you’re looking for a peaceful, quiet, clean and classy place to stay on the Oregon coast, I highly recommend “Windows on the Sea”. It’s easy to see why she won Trip advisor’s 2012 top rental for Rockaway Beach (a bit to my dismay, however, making it more popular!). I’ve never given any rental such a high rating but this is a top notch dwelling. Kudos to you, Denise, for making my birthday gift such a treat for the both of us. We hope to visit you again." "Extremely beautiful, relaxing and perfect vacation spot! My wife and I had the great pleasure of staying at "Windows on the Sea" in mid Jan 2014. It was a beautiful and relaxing experience. We were pleasantly surprised with how much we enjoyed our time there. We tend to be a couple that likes to be left alone and not have a lot of activity going on around us. The way these condos are built, gives one the feeling of being in your own home. Our stay at "Windows on the Sea" was absolutely wonderful. Our every need was met and we will definitely refer this place to our friends and relatives. We will surely be repeat visitors. We were surprised to see so many items provided that we had brought along with us; laundry soap, shampoo, bath soap, dish soap, spices, condiments in the fridge, cleaning supplies, etc." "Wave Therapy at Its Best!! This is the 4th time we've stayed at this condo. It's very clean, well stocked & a great place for my "wave therapy". When the weather is good, the beach is right there & you can walk for miles picking up shells & sand dollars. When it's not, we enjoy the view from the floor to ceiling windows. We book in Feb. & March in hopes we'll see a winter storm. The condo is well cared for, comfortable & feels like home. Denise, the owner, really thinks of everything. We'll be back next year! "Windows on the Sea was a wonderful place to vacation. The condo is beautiful, comfortable, and accommodating. The owner did a great job welcoming us and making us feel like we were at home. The best part for us was the view. We spent hours watching the ocean waves from the ceiling-to-floor windows and playing with our dog on the beach. We will definitely stay here again!" "When the elevator opened up into the condo we knew we were in for a real treat. Windows on the sea had all the extras you need for a wonderful stay. The view is just beautiful, the furnishing are very clean and up to date. We can't wait to return!" "Beautiful, clean and well equipped condo that is right on the beach!" Windows on the Sea is a fabulous vacation condo. It was clean, classy and well stocked with everything to make our stay great. The beach is intoxicating and we spent a lot of time walking up and down the shore. I was so excited to have collected 23 sand dollars and a ton of shells from the sands. My dog instantly was comfortable there, as well, which is a big deal for me. Rockaway beach was a nice short drive from Portland and gave us easy access to Tillamook and astoria. We stayed 4 nights and it was very enjoyable. Thank you Denise for making your condo available." "ABSOLUTELY PERFECT with everything you could possibly need and a view of heaven. My adult sons and I celebrate an early Christmas here each December. There is no place like it anywhere. The view is breathtaking, the linens, dishes, cookware and other amenities are luxurious and the ambience is peaceful and luxurious. We absolutely love it. The beach is fun but if the weather is inclement, simply enjoying the view while spending time together is wonderful." "Wonderful, even in winter! This was our second time here in this wonderful condo. We never dreamed we'd have three brilliant, sunny days in December! We talked to some other guests while we were there and found out that most of the other units in this complex have very small hot water tanks that are meant to provide both the heat (they all have radiant in-floor heating) plus all the rest of your regular hot water needs, and they simply can't handle it -- which means they're cold much of the year. Fortunately, the owner of this unit put in a 120 gallon tank, and we were quite toasty even with it in the 20's (!) outside. We could also enjoy that giant soaking tub without a hot water shortage. The wonderful kitchen has way more amenities than I have at home. It was actually a pleasure to eat 'in'. We highly recommend Windows on the Sea, and are looking forward to returning as soon as we can." "This place us the BEST!!! We had a wonderful time here and the condo is fully stocked. The view is the best we've ever seen! We HIGHLY recommend staying here!!! Another plus is that we got to have our dog with us!" "My best experience on the Oregon coast ..." My mom will soon be 96. She gets around pretty well with a walker but so many places with views have a flight of stairs. Once into the unit, it's easier and faster to leave her for the short errands. I live in iowa -- trusted the description for this place on the net. An elevator!!!! Ocean front -- elevator right into the unit -- very reasonable price. I prayed that it was true. Every trip may be her last -- time shared so valuable and important. WOW is what we both felt when the elevator doors opened on a very personal, warm and welcoming unit that felt like someone's home -- not a cold and sterile rental. Everything about it was wonderful. She was so happy -- so empowered -- so free. Nice clean quiet even in a storm elegant well stocked kitchen. Can't find enough words to paint how very incredible it was. An experience that has become a very nice memory." "We can't wait to go back. We had such a great time and the condo is so beautiful and well stocked! We HIGHLY recommend this place!!! "Five star weekend at Windows on the Sea! I can't say enough about how beautiful the view of the ocean was. The condo itself was also very nice and very well furnished. We were particularly fond of how complete the kitchen was. We cooked every meal for the four days we stayed and never once were lacking in cookware or proper cooking utensils. Beach access is also fantastic. There are no long flights of stairs or city blocks to walk - it seems like no more than twenty steps and your feet are in the sand. We will absolutely be back, and will recommend to friends and family." "This was our first experience with a vacation rental and it exceeded our expectations. Easy walk to the beach and great oceanviews from the living room. Loved being on the top floor especially with the elevators to bring up bags and us weary travelers. We kept the huge windows open as much as possible to enjoy the ocean sounds and fresh air. The king-size bed was much more comfortable than the hotel one we had the night before and a good night's sleep is a vacation must! The soaking tub and plush blankets made us feel like we were at a private spa. We also made use of the kitchen for breakfasts and even doctored up some bland takeout food from the array of spices provided, thank you Denise! We hope to stay at Windows on the Sea again someday soon." "Fantastic, well-equipped oceanfront condo. This was our second stay at Windows on the Sea condo. It is by far the most comfortable and well equipped condo we've stayed at on the Oregon coast. Anything you could possibly need to make a delicious meal or spend the day on the beach is on hand. The floor to ceiling windows provide unparalleled views of the beach and ocean. Rock away is a nice quiet uncrowded town - so if you're looking for a relaxing coast getaway, this place is perfect." "Our first stay at Windows on the Sea but not our last! The condo was so well equipped it was amazing. The surf was very relaxing and the view stunning! My sister and her hubby booked the stay. It was anniversary weekend for all of us. Thank you Lynn & Sally for an awesome time!" "A beautiful week! Sun, tide pools, good food and a happy dog :). Our second time here and we are sad to leave. Looking forward to our next visit!" "This was our second visit to this unit, and after staying in another unit here, we can definitely say Denise’s is the best! Your extra touches really make this a home: night lights, body lotion, good-quality shampoo & conditioner, towel racks, floor mats, etc. and the kitchen is stocked well. We saw whales yesterday – looked like a small pod…. We relaxed for a full week, split between here and the other unit. Thank you again for a memorable stay! We look forward to our next visit here!" "This was our second stay at Windows on the Sea. It feels like our home at the beach. We honeymooned at the Oregon coast and just spent our 30th anniversary here. Thank you Denise for the use of your wonderful home. We will be back!" "What a great way for us to celebrate our anniversary! We were pleased with the weather cooperating without plans and the front row seats at Windows on the Sea watching the waves. Already planning our next stay. Thank you for sharing your beautiful piece of Oregon with us!" "Stayed here for four nights to celebrate a 50th wedding anniversary and family reunion. The condo is beautiful. It is furnished very nicely and very well appointed. There is everything here you could ever need or want. The view is spectacular. We will have many lasting memories from this place. Thank you!" "Thank you, thank you! We have enjoyed our stay and will look forward returning soon - we will tell our friends! Everything was wonderful and clean & comfortable. Every day was full of fun, from running on the beach to the evening fire – warmed my heart…. The best part was spending this special time with my daughter and grandson --- in such a beautiful place. Thanks again!" "Thank you so much for such a beautiful place to stay. My mother and daughter and I had a wonderful, restful time looking at the ocean and walking on the beach. My daughter sepecially enjoyed the sand! Thank you again!" "Denise, “Windows on the Sea" was everything as promised! We enjoyed our stay in this idyllic condo. Rockaway Beach is the perfect jumping off point for visiting all the attractions on the northern coast. The beach is incredible and the roar of the ocean is magnificent. We thoroughly enjoyed our stay. Thanks for providing such a quality and comfortable place. Cheers!" "What an awesome weekend!! We rented 'Windows on the Sea' at the last minute on a whim. We are so happy that we did. The home is beautifully done and the view is outstanding. The furnishings are modern and comfortable and we were very pleased with the level of cleanliness. We were especially happy that we could take our dogs. Woof! We cannot wait to go back again. This is an awesome find! I am recommending it to all of my friends." "Best place we have stayed at by far! Absolutely loved this place. Denise has thought of every little thing you would need for a great vacation. Beautiful bathrooms, loved the huge deep tub! I am a total clean freak so was thrilled when I checked this place out. This will be our go to place whenever we come to the coast. Book it, you will not be disappointed. Thanks Denise for a wonderful stay!" "We came a long way to get here ... all the way from Florida! And it was worth it! We only regret we didn't get to stay longer & we're already talking about coming back again for a longer stay! Beautiful view, wonderful & comfortable & stylish accommodations. Perfect! "They say West Virginia is almost heaven. But take those cool blue ridge mountains and mix in a little beach, and puff, you have Rockaway Beach. Windows on the Sea has awesome views of the beach out of the living room and beautiful mountains (big hills to some) from the bedrooms. We stayed there In mid June and the weather was cool and misty -- exactly how I like it. The condo is well appointed. The beds are comfortable. We are from Florida and stayed here for a few days prior to a convention in Portland. We plan on coming back next year to this unit for two weeks. Our only negative is that the lack of fine dining. However, there is a well stocked local market and the kitchen is very well stocked and equipped for preparing ones own epicurean delights." "Our stay here was so wonderful. The beauty of the views, the serene decor, all the special touches ... we didn't want to leave! We are already talking about when we can come back. We found hundreds of starfish and many sand dollars at Indian Beach, enjoyed a delicious dinner at Pirate's Cove, and had a beach bonfire. What a perfect weekend!" "Amazing! Pictures do not do this condo justice, it's beautiful! Well maintained and equiped, we were travelling with seniors so the elevator was great. Denise was fantastic to deal with, we had family emergency which delayed our trip one day and she was able to rent out the condo and refund us one night accommodation on short notice. Thanks Denise!" "Our first time here but definitely not our last! Probably the best place we’ve every stayed. So clean! Fantastic view, bright, airy. Extremely comfortable furnishings, fully equipped with everything we could have asked for and more. Thank you Steve for the fantastic gift certificate. Thank you Denise for providing everything you do, and opening up this little piece of heaven to others! We cannot wait to go again! "This was our second stay in this condo and we can't think of anything that we would want to change.. The view is breathtaking and the condo is just beautiful! First thing in the morning we would sit with our coffee and watch the waves, and all day long unless we were out on the beach. The condo is so beautiful - it has everything you could possibly want or need, they haven't missed a thing. I loved preparing meals while enjoying the view at the same time! Wonderful getaway for a worn out CPA - we will make this our annual after tax destination. Thank you!" "What a wonderful piece of Heaven here on Earth. Thank you for letting us enjoy it!" "A beautiful place with comfortable, clean quarters to retreat to after beach walks. Hope to be back! Whale sighting evening of April 3! Thank you." "Denise – We all had a wonderful week. This is the first time we have rented outside of Lincoln City and loved the calm quiet beach. Our Labradoodle Tula was very happy that she got to join us and run on the beach. The weather was perfect this week – no wind! Very little rain. The condo is great. We cooked most of our meals here – doing dishes isn’t too bad with the amazing view!" "Spent an awesome Easter weekend with friends here in this lovely condo on the beach. What an amazing location and such a beautiful home. Thank you very much for sharing with us, we really appreciate it! We hope we can come back soon." "Denise – This place is fabulous, we couldn’t have asked for more. Love all the little extras, especially condiments, etc. So nice not to have to buy all of these when travelling. So happy your condo is dog friendly. Our labradoodle Ziggy loved her stay. We wish we had another week to sit relaxing with the spectacular view. I wanted to keep opening the lift door, too my breath away! Can’t wait to bring other family members, in particular visitors from the UK. Thank you!" “Simply Stated...One of the Best I've tayed at... Like to own one! Very nice place...very well equipped. and just gotta be hurricane proof! (The space heaters are a must in winter...) Except for the floor radiant heating...which takes about a day to work...everything was very nice. Did not have any hot water problems after the place heated up. It was cold that week... about 35-45 degrees. This is a very well equipped rental. They even had laundry detergent and softener... one of the best I have stayed at on the Oregon coast. We enjoyed our stay and would like to come back for sure. The rental process was seamless and easy, although I never talked to anyone at Vacasa it seems well managed... did everything by email. This unit practically sits on the ocean high tide line. The incoming surf rolls right up to the grass covered sand berm right below the front windows. Even so, seems very secure and very quiet at night. What a view during a big pacific storm!" Mark L. (FEBRUARY, 2013) *Owner's note: Our new 120-gallon water heater was just installed the morning this guest checked in, so the hot water tank didn't have a chance to come up to full temperature that day. It is now always on and always ready to keep the place toasty! "We love the West Coast – have vacationed and traveled it pretty much top to bottom several times and keep coming back. The ocean view and accessibility from this property is GREAT! And the condo is so inviting and relaxing. Thanks for keeping it such a clean, cozy, enjoyable place to be!!" "We were so happy with this condo. It has everthing you need for a great vacation. The information binder the owner provides is great as are all the extras -- books, movies and a kitchen that is fully stocked including oils and spices! ... "
"My week at "Windows on the Sea" could not have been more perfect. The condo was beautiful and comfortable, and the view was stunning. I was only steps from an amazing beach, and I had a front-row seat from which to watch some wonderful and powerful storms roll through. Spectacular view is right! I went to Rockaway with the intention of working; upon arriving, I rejected that notion. The space was so comfortable and private that I decided to retreat and reflect. I am better for having done so. I felt like I was at home--I had all of the amenities that I love and appreciate in my own home. Denise has added so many tasteful touches that all I needed were my own clothes and some groceries. The kitchen was organized and well-stocked (spices, condiments, tea and coffee; top-notch pots & pans, dishes & cutlery, and utensils; etc.). The bathrooms were spacious and clean. The bedrooms were uiet, and the king-size bed in the second bedroom was a treat. I much preferred this to staying in a hotel, or staying with friends and/or family. For the week that I was at "Windows" I was truly in a space that felt like mine. And now ... a word from my dog. Dog-friendly! Fun dog bowls, soft dog towels, and a great view of the birds on the beach! Dog-appropriate! Big waves, sea foam, smelly things on the beach--way better than the dog park. Woof! I really can't say enough, and I am already planning for my next visit. "Windows on the Sea" is beyond fabulous! Thank you, Denise, for sharing your little piece of paradise." "We had a great Christmas and New Years. What a beautiful view! Thanks for allowing dogs – our 8 month old puppy was in heaven!" "A wonderful early Christmas for a mom and her boys. I flew in from Atlanta, Nick from Moscow, Idaho and we brought Dan, an exhausted OHSU urology resident for his first 2 days off in a long time. This place is Paradise for us -- watching the wild ocean from such a cozy spot, hanging out together and seing Boise State beat Nevada! Who could ask for more? We'll be back!" "What a view! Wonderful 5 day stay. The view is the best ever. Even in November we had wonderful sunsets to enjoy. Home is well furnished and decorated. Very comfortable king bed. All you need for agreat relaxing time is supplied. Easy beach access." "My husband planned this weekend for us and my first words when we walked in were – “Home Run, Baby!” We’ve had a wonderful weekend and this is the BEST VRBO-type rental we’ve stayed in. Many thoughtful touches – the toiletries, the kitchen supplies – it really feels like a home away from home. We will be telling our friends about this place and will be back ourselves!!" "Wonderful 5 day stay. The view is the best ever. Even in November we had wonderful sunsets to enjoy. Home is well furnished and decorated. Very comfortable king bed. All you need for a great relaxing time is supplied. Easy beach access." In a word – Bliss!" "You won't find a better view! A very well placed condo, just back of the first dune, with floor to ceiling windows. The view is just all sand and Ocean with a long shallow beach that produces 3 or 4 wave breaks constantly. The condo is very well accoutered. It has literally everything you're going to need. From pots, pans, glassware and spices in the kitchen to beach going accessories in the closet you really only need to ring clothes and food. The town of Rockaway Beach is such a classic old school beach town. It's tiny and quaint and friendly, not fussy and overpriced like some of it's neighbors (re: Cannon)." "WOW! A perfect place to enjoy stormy weather! We love the beach and visit it year round, but Windows on the Sea just refreshed our memory of how magical the coast can be in story weather! In this condo, you're surrounded by giant floor-to-ceiling windows with nothing between you and the ever-changing sea, the sky and the beach. It makes you feel like you are literally out in all that dramatic weather, while actually being extremely cozy and comfortable inside. We can only imagine how wonderful it must be in the summer too. The unit is very generously equipped with everything you could think of (even rain coats and boots! ), and our host, Denise, was a gem to work with. We've stayed at countless beach rentals over the years and highly recommend this one to anyone." "What a great time we had! We had sunshine, sunsets, rain, wind , thunder, lightening and great waves. What a view! What a clean, relaxful, inviting place to stay. We will be back for sure!" "Wow! – My new favorite place on the ocean. We celebrated a 62nd birthday. Beautiful weather the first 2 days and then stormy -- perfect!" "We’ve been coming to the coast for several years and 5 years ago we were pointed to Rockaway where we’ve been every year since … We’ve been very impressed: the view, the privacy the design & the comfort. Then there’s our host who has gone above and beyond with the stocked cupboards and other conveniences, like the comfy bed and throw blakets. What an amazing place. Thanks!" "Wow! What an amazing place! The view is simply breathtaking. It was so cool to wake up every morning to the sound of the waves! I would like to thank you for sharing this piece of Heaven on Earth with us. We will forever remember our stay here. Thank you so much! We were pleasantly surprised at how well everything was though out. From the rainboots and coats to the ice cream scoop. Thanks again!" "Took our breath away! We can't say enough about the incredible view from this unit, the quality of the structure (quiet), and the amenities included in the condo--not to mention the easy beach access. We highly recommend this condo, and we will absolutely return again and again. This was one of the best get-aways we've experienced. Thank you so much!" "We’ve stayed at several vacation condos over the years and this has to be one of the best. The view is breathtaking! Thanks so much for everything!" "Thank you for a glorious sanctuary to rest and rejuvenate – beach, sun, and cozy place to lay our heads in the evening. We will be back! Maggie doesn’t want to leave! Great dog fun!" "Stunning views! We absolutely loved our stay in this property. The views from the living room and kitchen were just lovely. The kitchen was fully stocked, and even contained some basic pantry items, which were a great help. Cozy beds, spacious bathrooms. Really, a great stay. We hope to return!" "Amazing Stay. We loved our comfortable stay in this beautiful property!! amazing views! We loved all of the comforts of home provided in the condo, and the ability to just walk right out onto the beach. We had a wonderful vacation here and would definitely recommend it to others!" "This place was an incredible find. Best friends visiting for a beautiful few days, hoping to make it an annual adventure." "Beautiful! Stunning! What a lovely home! Many Thanks!" "Nirvana by the Sea. My husband and I have traveled all over the world and have stayed at many beautiful places - but this condo just knocked our socks off - we never wanted to leave. Did not need to bring a thing except food, wine & clothes. Never rented a place at the beach so well outfitted - one word for this place - RELAXING! - we will return." "Wow! We had such a fun time. This place is beautiful – The view, the condo, the convenience, the privacy, the cleanliness – I could go on and on! We had rain, sun and crazy wind! So big we had to tie a shoe to the kite to get it to fly. We had a beach fire one night with picnic food! Went crabbing, bicycling, beachcombing, hiking and also relaces, A LOT! We wish we had booked a while week, but we will just have to come back!" "Well okay … twist my arm. I guess we’ll have to come back. Wonderful and very relaxing. Subtle and elegant décor. Well stocked with extras! And the view… all you see is ocean. Rockaway Beach put on a great firewords display. I heartily second the previous entry's sentiment. Thanks to all for making this space available to us transitory mortals. We have traveled to many beautiful places around the world & I’ve never before felt such a rejuvenation of my spirit – something about hearing the ocean tide in your living room! We will return! Thank you! "I wanted to thank you for the use of your excellent vacation home. My family and I were completely blown away by the setting. The unit was fabulous, the views were spectacular. It was such a nice day/night with my parents. We were all so impressed, and it will make for such a memorable weekend. I will certainly recommend your place to friends and will keep it in mind for upcoming beach trips. Thanks again!" "*A Splendid Respite*! Four seasons in four days. A destination ultimate. Where to go from here? Why? Preposperous sunsets. Thanks to all involved in making this space vailable to transitory mortals." "A fabulous find on the Oregon coast. We used to travel to Yachats, but no more when this is so close! The town folk were very friendly and fun. The views lovely, the dogs loved it, the eagle still here, the faux fireplace top notch The kitchen well stocked, we worked our way through grilled rib eyes, salmon, Italiana night nd ribs, WOW! The final sunset bittersweet as it is our last ight and it sinks into the sea. It certainly will be our new coast rental. Love, love, love!" "This beautiful, light-filled condo overlooks the ocean with the most breathtaking view you can imagine. The beach, just steps from the front door, is perfect for long walks and hunting shells. The gourmet kitchen and attractive, comfortable furnishings add even more to a wonderful stay. An elevator takes you from the covered garage to a private front door entrance on the top floor. No stairs to climb with luggage. A great balcony to watch the evening sun setting over the ocean. No matter what the weather is, you will truly enjoy staying in this condo. "We felt like we were the only people on the beach, it was a great location & condo with everything we could ever want or need, just add food & cocktails and you never have to leave. The dogs were worn out & happy, the adults were relaxed and well fed! We had great meals in that open kitchen and the BBQ was an added plus. I think we found our new favorite place & so close to Portland!" "This is a great condo that exceeded expectations - a classy & comfortable beach/nature experience. The condo looks out over grassy dunes and the beach. One can't see any other buildings out the expanse of floor to ceiling windows. Very private. Wonderfully furnished with comfortable couches, beds and everything one could want in a kitchen and a small deck with rill. Clean to boot. The beach walking is the best. Close by seafood shop and a small town making cooking a breeze." "What a glorious weekend! Perfect weather! Even better accommodations – and to top it off an adult bald eagle perched on the log to the left so we had a great view of him for an hour!" "Fabulous! We felt like we were the only people on the beach, it was a great location & condo with everything we could ever want or need, just add food & cocktails and you never have to leave. The dogs were worn out & happy, the adults were relaxed and well fed! We had great meals in that open kitchen and the BBQ was an added plus. I think we found our new favorite place & so close to ortland!" "What a marvelous few days; everything was perfect!" "Our first visit to Rockaway and definitely not our last! What a beautiful and relaxing place to enjoy the beach! We’ve never experienced views like this before. Hardly want to leave the condo! Thanks so much for the elevator, what a treat. Already planning our next visit to “Windows on the Sea!" Thank you for putting so much care into the details." "Finishing up our 7th night here for our anniversary. Could not have asked for more. This beautiful place is all that Denise’s website promised. We appreciate the addition of the BBQ! This was our first visit to Rockaway and hope it’s not our last. We beach itself is blissfully peaceful along with the magnificent sound of the waves. Beach walks, reading, cooking, wave-watching (and whale watching), restful nights.… Memorable sunsets - a memorable week! And thanks for our morning coffee!" "Thank you for sharing your wonderful condo with us. We were originally going to vacation in Kauai, but decided to stay close to home and found your place on the internet. I have never stayed at a place as wonderful as this on the Oregon coast. The view is breathtaking and the beach was gorgeous, and you have really made a home away from home here. The condo was filled with beautiful light all day long and was clean and well appointed. We really appreciated all the things that made the ondo so comfortable and lovely to stay in – the great books, CDs DVDs, soft pillows and throws, comfortable beds, beautiful linens, great napping couch, nice front loading washing machine, beautiful and well maintained urniture, comfortable deck furniture, great kitchen and amenities - steak knives, wine decanter (!) – the list goes on & on. This place is amazing. We've had a fantastic time and found a little “paradise” in Rockaway. The Hawaian Slack Key Guitar CD also helped with that. We’ll be back …." "Exceptional vacation rental! We have stayed in quite a few vacation rentals on the Oregon Coast and enjoyed this one the most. The close proximity to the beach can not be beat and the unit itself was extremely nice and very comfortable. Having an elevator and luggage cart to haul all our things up was so convenient. I do suggest that if you are planning on cooking most of our meals, to make sure you bring everything, because as far as we could tell, there wasn't a grocery store in Rockaway. * The owner of the unit does have most needed condiments in the fridge and also things like oil and spices for cooking and baking. They even had ziplock bags and foil, which I usually have to pack so that there is a way to keep leftovers. All the little things on top of the awesome view make this a home away from home. We will definitely be booking again, hopefully soon!" *Owner'snote: there are small but well-stocked markets in both Rockaway and Garibaldi, and a major supermarket at the north end of Tillamook, about 15 minutes south of Rockaway. "This was our first time to Rockaway. It was an awesome trip! Our dogs loves it too! This place offers great access to the beach, incredible views of the beach activity and comfortable living conditions; exactly what we were looking for. The people in town were friendly. We will definitely be back soon." "This was the most beautiful place we have ever stayed! The view out the floor to ceiling windows was better than we could have imagined possible. The condo is beautifully decorated and very comfortable, and has everything you could need for your stay. We spent hours just watching and listening to the surf, the big windows open wide so it is almost like sitting outside on the beach. We will definitely be back to Windows on the Sea!" "We really enjoyed the fine furnishings, great view, easy beach access and full stocked kitchen. Very nice extra touches!" "The Best of Rockaway Beach! My wife and I love the simplicity of Rockaway beach. Beach is long and often quiet. We've been going there for many years. Since witnessing the building of the condo few years ago, I've always thought it would be the the best vantage point. Finally got to stay in it and it didn't disappoint. Wall to wall view of the north end of Rockaway beach, truly a gourmet kitchen, comfy and roomy bedrooms, elevator that empties right into the condo, smart collection of books and movies, did I mention wall to wall view of the beach? They allow dogs too, which is a must for us. The condo is warmed by radiant heat from the floor, which I'm especially fond of. Denise, the owner was always available by phone and extremely accommodating. We've stayed at a variety of hotels/condos on Rockaway in the past 20 years and this place tops everything. Also the price is reasonable. If you've never been to this area of Oregon, this condo is in a good sight seeing location, that is if you can peel yourself away from the sofa in the living room looking at the amazing view." "Rain, sleet, hail, snow, sunshine, blue sky, billowing clouds, the ocean steel grey to jewelry turquoise – a typical March weekend at the Oregon Coast! We had a wonderful time watching seals playing in the surf from the breathtaking view out the wall of crystal clear windows. And what a blessing it was when a bald eagle flew by, not 30 feet away! Up the coast and slightly into forest we spotted a herd of elk, two five-point bucks, and five does – too early for babies. Thank you SO much! The accommodations were lovely – everything we needed and nothing we didn’t. So tastefully appointed! We look forward to coming back!" "A beautiful place to match the beautiful scenery! Perfect place to enjoy winter weather in comfort." "D & C, Couldn’t have been a better time at Rockaway. This had to be maybe the best experience we’re ever had on a very rainy 3 days. The best, most well-equipped condo and vantage point couldn’t have been better. This place is IT! LOVED IT! Thanks so much!" "Denise, thanks so much for sharing your condo! We have had an amazing 4 days! Having a “front row seat” – especially with the storms that blew through – was absolutely incredible. I desperately needed some “wave therapy” when wearrived. I couldn’t have asked for a more awesome plate to watch the waves! We only left once, for dinner. We are leaving relaxed and rested. Thanks again!" "All I can say is WOW! This place was a dream! All the things the owner supplied goes way above any expectations I could have. So nice of the owner to keep condiments, coffee, etc. Wish I would of known. Next time we come, I’ll have to pack less. Also the place was extremely clean! Views outstanding, and it was so peaceful. Can’t wait to bring my folks! They love the beach, but have a hard time with stairs. Elevator a major plus! Never have I stay at such a luxury place on the beach. This place is awesome!" "Denise, you couldn’t have finished our Oregon experienced in a better way! We love it here. You have the best vacation rental ever, not only does it sit in a fabulous Location, but it ffers all the comforts, bells and whistles that a traveler could wish for. Your extremely well equipped kitchen made our stay with our ittle one a breeze! Loved it, loved it, loved it! Charming, elegant and sparkling clean! THANK YOU! We’ll be back." Wow! What an amazing place to experience the Oregon coast. It was wonderful. We just loved the open view and could not believe how well thought out everything was for our comfort, all the way down to the grounded coffee and well stocked kitchen. You have such a beautiful home. This is definitely the very best ever! The view, the décor, the comfort the peacefulness, it is so rejuvenating. We will definitely be back many times as this place is the best!" "A really lovely stay … Wanted to stay for a week and soak in the beautiful natural light and soft background of the ocean. Can’t wait to come back!" "Great location on the oceanfront! Loved the view and the light that came in through the large windows. Loved that the windows opened both from the top and from the side. Loved having the elevator that opened right into our condo; how convenient is that?! The decor was lovely, updated, and clean. The accommodations were fantastic. Never have I stayed at a place as well stocked with cooking utensils. Thanks so much. We had a wonderful stay at the coast." "Wow and stunning. First time to the coast of Oregon for me, but not my hubby. Very pet friendly place. We will be back for sure." "This condo has the best view of any place I have stayed at on the coast. The condo was very clean and well stocked." "Your place is amazing! Outstanding architecture, gorgeous views – wonderful way to spend a coastal getaway. Warm and welcoming interiors plus extraordinalry supplies – we ate like kings! Thank you, we'll definitely be recommending this to friends and family." "Wow! From the moment we stepped through the door we've been in awe of the gorgeous view! We're right in front of the ocean with nothing between us, and we can see, literally, miles down the beach both north and south. The condo is beautifully furnished with lots of thoughtful touches, and it's clean and bright. We've had the best vacation we can remember and feel like we've discovered a bit of paradise! Thank you so much, we'll certainly be back!" "What fun to get off the elevator directly into the condo! All filled with endless ocean and beaches as far as the eye can see. The place is wonderfully and thoughtfully furnished in great taste. I wonder if they would let me live here year round? Will return again and again! With thanks for the best stay ever." "Our stay was wonderful. Very well stocked, very quiet and beautiful view. We'll definitely be back! Thanks again." "The finest view on the coast and the most elegant beach rental getaway as well. We’ll be back often."